Congressman Engel also expressed concern of many members of Congress with low employee morale at the Broadcasting Board of Governors under the management of the International Broadcasting Bureau (IBB). Ranking Member Eliot Engel’s statement and that of the Committee’s Chairman, Rep. Ed Royce (R-CA) who said that “While the Voice of America aims to provide listeners with objective news and information about United States foreign policy, the so-­‐called ‘surrogate’ broadcasters such as Radio Free Europe/Radio Liberty beam news into closed societies, offering information those citizens are otherwise denied,” seem to indicate that neither member of Congress believes those who argue that there are no longer any significant distinctions in missions between Voice of America and surrogate broadcasters. The strongest proponent of the claim that such distinctions do not exist was former BBG Governor S. Enders Wimbush who was one of the witnesses at the hearing. He advocated merging VOA with surrogate broadcasters into a private entity. The other witnesses at the hearing were: former BBG Chairman James Glassman and former BBG Governor D. Jeffrey Hirschberg. James Glassman stirred controversy by saying that the Broadcasting Board of Governors is not defunct and advocating putting BBG, including Voice of America, into the State Department. 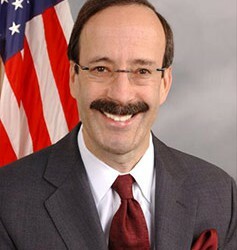 Rep. Engel was referring to the Office of Personnel Management (OPM) surveys showing that the management of U.S. international broadcasting, consisting largely of top executives of the International Broadcasting Bureau headed by Director Richard Lobo and Deputy Director Jeff Trimble, is rated as being among the worst in the entire federal government. Chairman Royce, thank you for calling this timely hearing on an issue that impacts millions of people around the world – U.S. international broadcasting.